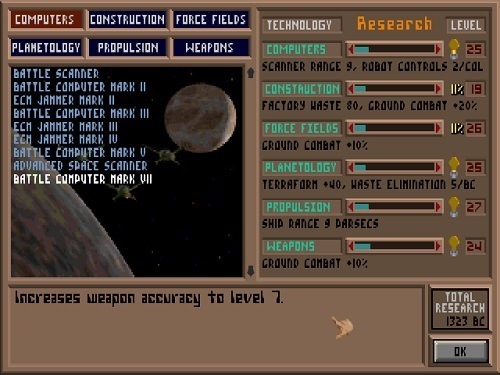 Master of Orion was originally released in 1993 and is one of the most highly acclaimed games in the turn based genre. The game takes place in a science fiction setting with plenty of 4X features built into the core gameplay. The goal in Master of Orion like many other spaced based strategy games that came after it is to conquer the galaxy by using diplomacy and war. In order to do this you’ll explore a large game world while colonising plants that you come across. Each of these game worlds are generated randomly with players having some control over certain parameters. Master of Orion features 10 different races for players which each have their own strengths and abilities that alter the way they play the game. Some races also naturally dislike and like other races which adds another level of depth to race options. In each game of Master of Orion you’ll start with a home world, two scout ships and a colony ship to start your first new colony. Much of the early game involves exploring new planets with scouts (trying to find habitable plants) and colonising them to increase your overall production and population. As a turn based game players can take as much time as they need in each turn to decide how to put their grand strategy into place. There is no shortage of vital decisions to be made during each turn which are all done through the various point and click menus. In Master of Orion you’ll have to make decisions relating to ship movements, colony management, ship construction, technology, diplomacy and more. Return to the roots of the turn based genre with the first and best game in the Master of Orion series. 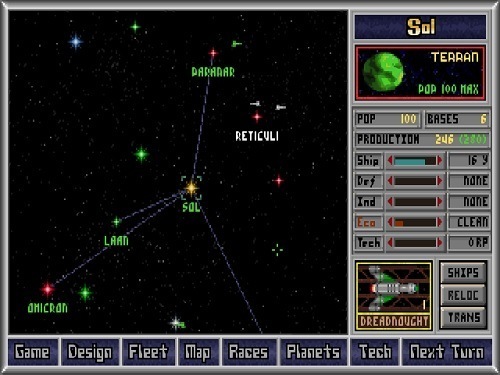 One of the early strategy games. Huge amount of strategy depth to explore. 10 very different races to play as and against. Solid gameplay that still holds strong today.